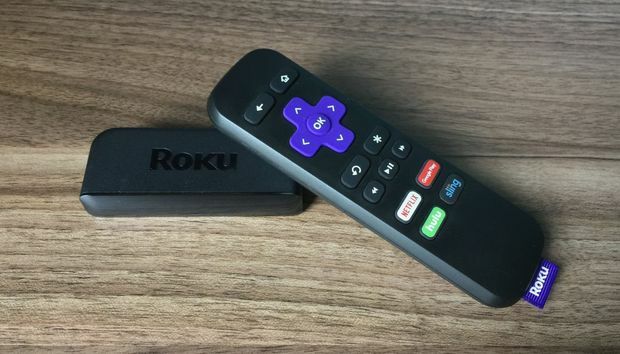 Aside from Its $30 price tag, the Roku Express feels like a streaming box from a bygone era. It’s reminiscent of a time when we didn’t demand much from our media streamers beyond a simple way to access Netflix or Hulu; when were more willing to tolerate choppy performance and finicky remote controls. If your TV setup requires a longer cable—because it's mounted to the wall, for instance—the best way to anchor the Roku Express is with a strip of double-sided tape, which is also included in the box. You can then stick the Roku Express to your television’s frame or to an entertainment console, which is both a clever idea and a clumsy form of compensation. In any case, the adhesive is strong and comes off clean, though it doesn’t maintain its shape well after being removed. In terms of bandwidth performance, it’s also worth noting that the Roku Express is limited to 2.4GHz 802.11b/g/n Wi-Fi, which will be a problem if your airspace is congested with legacy wireless devices--you won't be able to take full advantage of that dual-band 802.11ac router you bought. There’s no ethernet port for wired connections either, no USB port for local media playback, and no optical audio output for connecting to an A/V receiver (although the enthusiasts who might want such features wouldn’t buy a low-end streamer like this in the first place).